KeyLines has published this white paper and page documenting the use of graph visualization to combat review fraud. Review fraud happens when user-generated review on sites like Amazon or Yelp are manipulated, damaging the website's ecosystem and user trust in the site. More sophisticated models need to be built to recognize patterns associated with fraud. 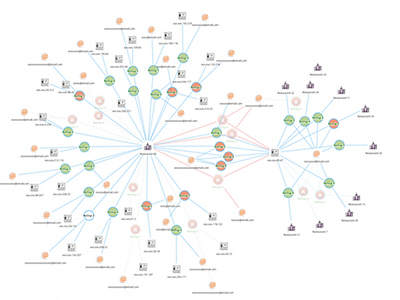 Graph visualization can help isolate the source of the fraud by looking at the connectionsamong businesses reviewed, IP address of review, and device. 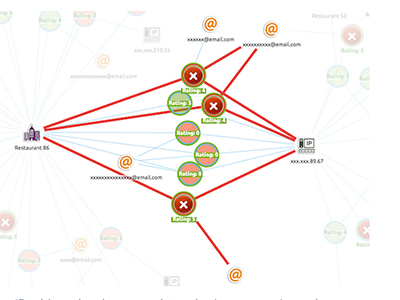 This graph visualization depicts reviews thought to be fraudulent as red, and red nodes depict reviews previously removed as fraudulent. For example, visualization of the network helps pinpoint problematic IP addresses, or businesses using multiple IP addresses.